Edward Bulwer-Lytton was a prolific English author very popular during the 1800's who reportedly amassed a considerable fortune from his writing. We owe to him such common phrases as "the great unwashed", "pursuit of the almighty dollar", "the pen is mightier than the sword", and the famous opening line "It was a dark and stormy night". Apparently though, history has not be all too kind to Mr. Bulwer-Lytton. What was popular then is frowned upon today and this gentleman's writing is put forward as an example of what not to do. This exemplifies according to the literary critics what is called "purple prose"; a style of writing so extravagant and ornate, it breaks the flow of the narrative. Just how bad is this? There is the annual Bulwer–Lytton Fiction Contest which awards a prize to that person who is able to come up with the worst opening line for a novel. Geesh, imagine having your name go down in history as a warning? William Shakespeare has been lauded, studied and considered one of the pinnacles of the English language for over four centuries while Eddy is mocked by none other than Snoopy from the Peanuts cartoon. What ignominy waits for us after our deaths? Chris Baty, the founder of NaNoWriMo, has written a book called "No Plot? No Problem!" which is qualified on the cover with the line "A low-stress, high velocity guide to writing a novel in 30 days". With a deft touch and a comedic slant, Mr. Baty offers encouraging words to those who want to take on the personal challenge of writing a 50,000 word novel. He points out quite clearly that the goal here is the doing not the final product. Writer and championship figure skater? Chris is one funny guy but he does have a point. No procrastination, just do it. Start and don't stop until you're finished. And who said that was just a slogan for Nike? It does make a lot of sense. The following comes from the NaNoWriMo Press Kit 2011. I see Mr. Baty's sense of humour and yes, you do need a sense of humour about this. Symptoms include flashes of brilliance, questionable plotlines, and blatant use of mixed metaphors. 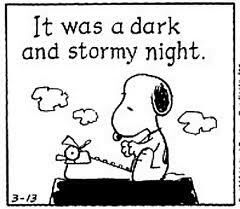 November, Snoopy and Bulwer-Lytton: so these three things really are related. By the way, Chris Baty is quite funny and I would highly recommend getting his book "No Plot? No Problem!" It's an amusing read about doing NaNoWriMo and does offer some great encouragement to anybody thinking of setting the (their) world on fire. "It was a dark and stormy night" is an infamous phrase written by Victorian novelist Edward Bulwer-Lytton, 1st Baron Lytton at the beginning of his 1830 novel Paul Clifford. Purple prose is a term of literary criticism used to describe passages, or sometimes entire literary works, written in prose so extravagant, ornate, or flowery as to break the flow and draw attention to itself. Edward George Earle Lytton Bulwer-Lytton, 1st Baron Lytton PC (25 May 1803 – 18 January 1873), was an English politician, poet, playwright, and prolific novelist. He was immensely popular with the reading public and wrote a stream of bestselling novels which earned him a considerable fortune. my blog: NaNoWriMo: Write a novel in 1 month? "Once upon a time" is a stock phrase that has been used in some form since at least 1380 (according to the Oxford English Dictionary) in storytelling in the English language, and seems to have become a widely accepted convention for opening oral narratives by around 1600. These stories often then end with "... and they all lived happily ever after", or, originally, "happily until their deaths". These are examples of the narrative form, and occur most frequently in the narratives produced for children aged between 6 and 8. "The pen is mightier than the sword" is a metonymic adage coined by English author Edward Bulwer-Lytton in 1839 for his play Richelieu; Or the Conspiracy. ... In 1870, literary critic Edward Sherman Gould wrote that Bulwer "had the good fortune to do, what few men can hope to do: he wrote a line that is likely to live for ages." ... The Thomas Jefferson Building of the Library of Congress, which opened in 1897, has the adage decorating an interior wall. How To Liz - 47: How to NaNoWriMo!